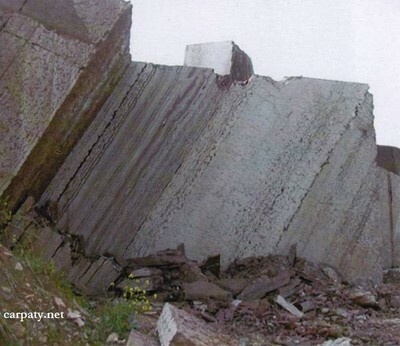 Regional Information Center "CARPATHIANS" » NOVOSELYTSKE JURASSIC SEDIMENTS OUTCROP. 48° 10′ 47″ N lat; 23° 44′ 13″ E long. At the upper reaches of the Luzhanka and Vilkhivchyk Rivers on the mountain top there is located limestone quarry. 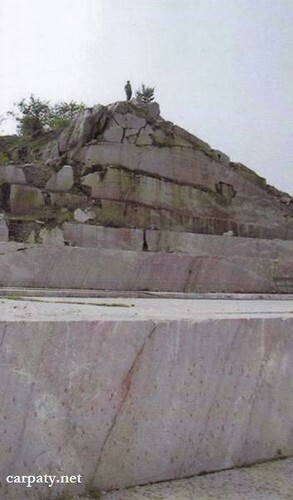 There are exposed Jurassic pink, red, and yellowish limestones which are cut by steeply-dipping Upper Jurassic — Lower Cretaceous dyke of dark brown-greenish diabases. 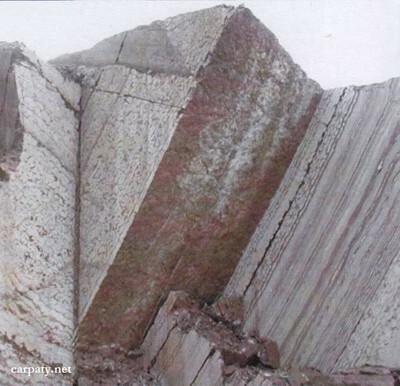 Limestones occur as tectonic wedge and in the east along the fault they are in contact with extensively folded dark-grey argillites and aleurolites of Lower-to-Upper Jurassic Tysalska Suite. Under conditions of ideal exposure one can observe there extensive tectonic deformations and fine-block structure of most mobile southern strip of Trans-Carpathian deep-seated fault. 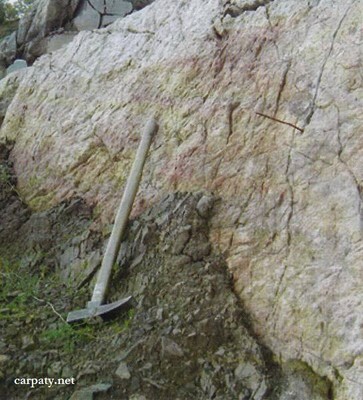 The outcrop can be considered as a standard for the studies of Carpathians geodynamics. Besides this impressive limestones coloring and patterns could provide esthetic pleasure to the nature- and colored gem-fanciers. « SOYMYNSKE EOCENE SEDIMENTS OUTCROP.